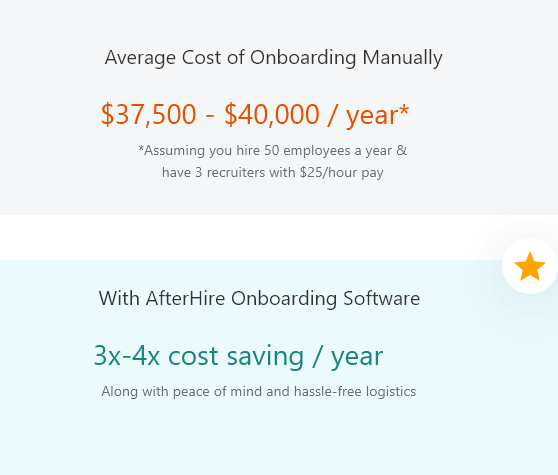 AfterHire is a powerful onboarding software that helps organizations reduce employee turnover, achieve higher productivity in quicker time and cut down costs associated with traditional onboarding. 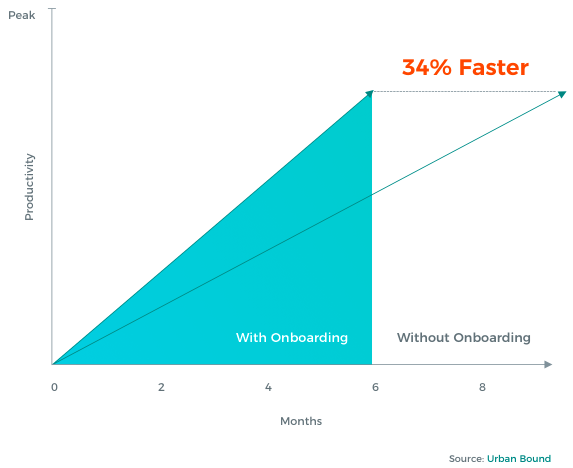 Why is Employee Onboarding a must-have for every company? A great employee onboarding program enables new hires to achieve peak productivity in a shorter time span. Better onboarding produces highly engaged employees and better results. Coordinating onboarding tasks manually is time-intensive and costly. AfterHire helps you slash those expenses. With Automated workflows, HR can say goodbye to headaches of email-based follow ups and coordination. Empower HR with the metrics they need to optimize processes. Ensure that sensitive data of employees are only accessible to the right personnel. Impress candidates with a digital onboarding experience and a branded employee portal that’s accessible on mobile devices too. 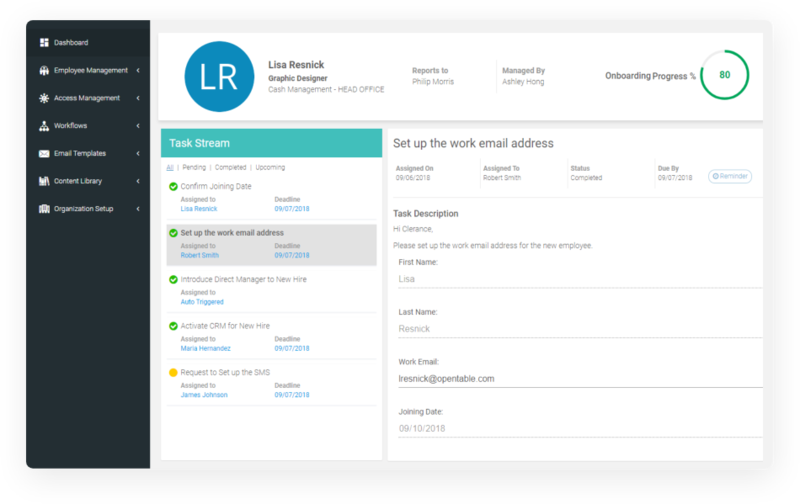 Capture the employee information your business requires and have all your employee data in one, organized place. With reports, you can identify bottlenecks in your onboarding process & improve over time. Every new hire has to cut through paperwork to complete the induction process. Make this process super simple with automation & dynamic forms. Computers, furniture professional gear etc. are basics that your new hires need to function. Eliminate delays by keying this into your onboarding process. Have your incoming employees learn about their new family by formalizing team introductions. Training and learning is a core part of becoming productive. Empower new inductees with timely information and resources to succeed. Every company’s way of inducting an employee is different. That’s why AfterHirecomes with a workflow editor to model any process you can think of. Onboarding an employee requires participation from various departments. That’s why tasks can be assigned to anyone in the company. Learning is an essential part of an onboarding roadmap. Assign training tasks to employees and ramp them up on your in-house processes & tools. Allow everyone involved in the task to discuss via a comment feed. Impress New Employees by communicating with them via a content-rich portal complete with. One of the byproducts of onboarding is capturing details of your new inductees. 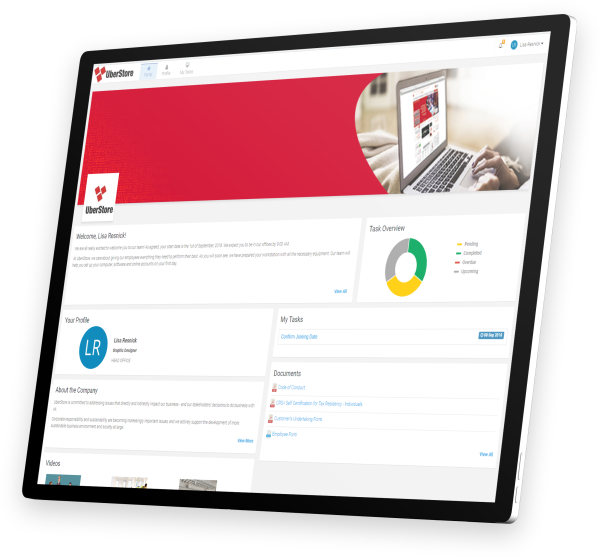 Customize the employee profile record you wish to use by using the intuitive Form Builder and capture the data points you need. Moreover, design and assign custom online forms for employees to fill out during the workflow and view their submissions in one place. What Do Your New Hires Want from Your Onboarding Program?